Aculon, a proven supplier of industrial-grade coatings, introduces their patented Hydroxyl Functional Adhesion Promoter. 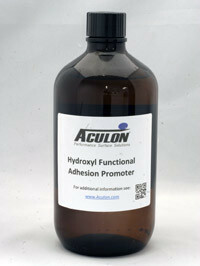 Aculon's Hydroxyl Functional Adhesion Promoter is easy to apply and will enhance your surface's adhesive capabilities. Aculon’s Primers are easy to apply and can solve problematic adhesion issues. Also, their actives can be blended into existing formulations for increased surface adhesion of coatings and adhesives. Apply Aculon Adhesion Promotion Surface Treatment via dip bath for 30 seconds to fully treat parts with a uniform treatment ensuring even coverage over entire part. Aculon Primers comes in convenient 1L or 4L quantities for dipping applications. Option - Wipe Apply Aculon Adhesion Promotion Surface Treatment via a simple wiping process. Using a clean cloth, wipe the treatment across the surface in a buffing motion. Option - Spray Spray the solution onto the substrate using double passes. Post-application curing is recommended for best performance. HVLP (Binks Mach 1), HVLP (Devilbiss JGHV), Air Atomization (Devilbiss MBC gun) and Airless (Graco Model 225-292 President Pump Series A).